About 30 cosmic rays travel through your body every second. In a night of sleep, up to a million of them will have gone through you! What are they? Well, they are cosmic, but they are not ‘rays’ in reality. They are mainly protons, alpha particles (helium nuclei), some electrons and even some anti-matter. They have a variety of energies (107 – 1020 eV) and their origin, in general, is not well understood. In fact the majority of the primary cosmic rays do not reach the ground – they interact with other particles in our atmosphere, and it is typically secondary cosmic rays – muons, neutrons, protons, alpha particles, electrons, etc. – that hit the Earth’s surface (and us). Going upwards in energy, the probable sources of cosmic rays are from solar flares and coronal mass ejections from our Sun, shocks in supernova remnants, other high energy sources or events within the Galaxy, as well as high energy sources or events from outside of our Galaxy. One of the observatories able to detect cosmic rays is HESS (High Energy Stereoscopic System). It has operated over the last decade or so. In theory, sources within our Galaxy should be able to produce particles up to at least one petaelectronvolt (PeV; 1015 electronvolts). This implies that our Galaxy contains petaelectronvolt accelerators, so called ‘PeVatrons’ – but their location has proved elusive. Not even the handful of shell-type supernova remnants, commonly believed to supply most (lower energy) Galactic cosmic rays, has shown the characteristic tracers of petaelectronvolt particles. Using HESS, a system of imaging atmospheric Cherenkov telescopes, astronomers have detected a very powerful source of cosmic rays in our Galaxy. Deep γ-ray observations by HESS of the region surrounding the Galactic Centre show the expected tracer of the presence of PeV protons within the central 10 parsecs of the Galaxy. The area imaged is mostly molecular gas and the γ-rays result from the interactions of relativistic protons with the ambient gas in this region. The well-known supermassive black hole Sagittarius A* (Sgr A*) at the centre of our Galaxy may be linked to this PeVatron. 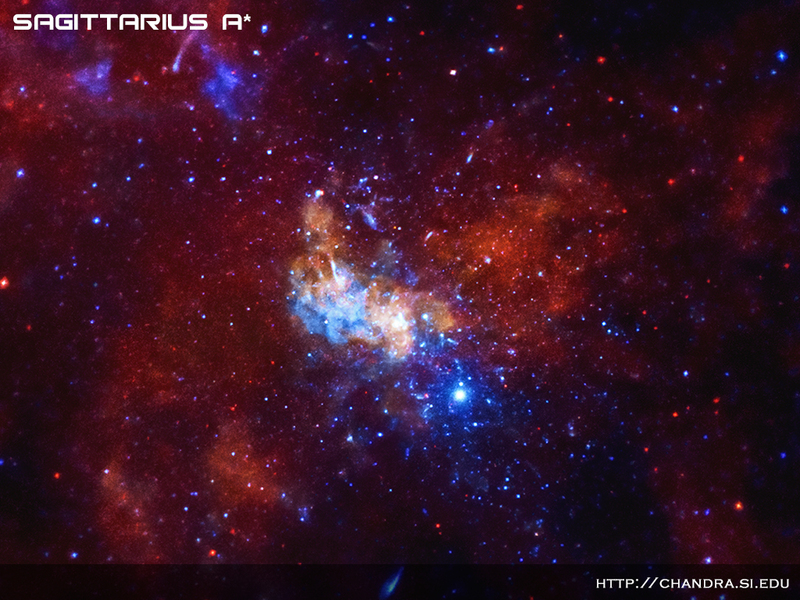 Although its current rate of particle acceleration is not sufficient to provide a substantial contribution to Galactic cosmic rays, Sagittarius A* could have plausibly been more active over the last 106–107 years, and therefore should be considered as a viable alternative to supernova remnants as a source of PeV Galactic cosmic rays. However there are potentially other sources near to the Galactic Centre that can not be completely ruled out as cosmic ray producers: these include the γ-ray source HESS J1745-290, the pulsar wind nebula G 359.95 – 0.04 and a source of anninihilating dark matter. Other sources like supernova remnants do not have the capacity to inject ultra-high energy particles over the required timescales of a few thousand years. A key finding is that the source location observed by HESS is within ~10pc of the Galactic Centre. This combined with timescale arguments tend to rule out supernova remnants, compact stellar clusters and radio filaments as the source of PeV cosmic rays. The most plausible origin of ultra-relativistic protons is from the vicinity of the 4 x 106 solar mass central black hole. The exact origin is not known but it is most likely to be associated with processes near the black hole – i.e. accretion or jet-related events. The requirement centres on the central black hole being 10-100 times more luminous to accelerate protons over the last 106–107 years to produce the observed PeV events. The most energetic source of cosmic rays from inside our Galaxy may have been found.